I don’t know how I found anything to write about for this day, my notes say Morpeth to Corbridge - hilly. Following morning I could not eat breakfast. I was weak and still sick and tired due to lack of sleep, I don’t know what was wrong but I didn’t want to let anyone down, Graeme said I was dehydrated. We discussed the possibilities and had a change of plan. Complete the Alphabet ride but finish at Corbridge not down to Durham. After letting Karen know what was happening, She agreed to come and meet us at Corbridge. 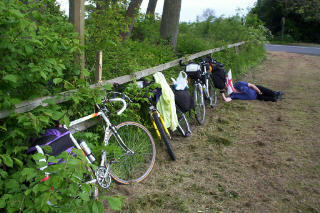 We set off about 10 o'clock, I felt rough but struggled on.4 miles uphill out of Morpeth, was this a good idea? I fought on and on. The hill was not that steep but in my weakened condition it felt like a vertical climb. We made very slow progress, even the weather changed, it was dull and cool. It must have been a pain going so slow but we carried on. After stops at Belsay and Stamfordham the smallest rise was a mountain. 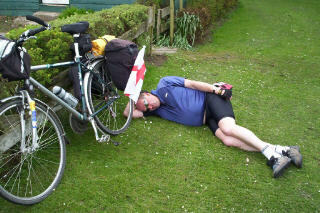 I collapsed to the ground at Belsay and even fell asleep in Stamfordham Cricket Club Car Park. How I made it from Stamfordham to Corbridge I will never know, team work, being kicked pushed and cajoled but we slowly ground out the miles. Graeme trying to pick the flattest, quietest, shortest, possible route. We eventually made it to Corbridge so we completed an Alphabet ride. With a two mile downhill finish into Corbridge. First junction and there was Karen waiting for us. Amazing. Thanks Karen for collecting us and taking the final picture. I slept most of the way and that cup of tea in Karen’s was a life saver. Well another ride over and although we had to do some damage limitation. We were flexible and we still completed a ride. What of next year I don’t know. Corbridge is a natural starter point. We will have to decide the “D”……….Somewhere Flat. Plus we have cycled most of the Mainland now apart from Wales. And the South East!!!!!!!!! It was muted about a French ride next year to celebrate our 10th Anniversary. Plus I think we may have to trim the mileage. 40 max per day especially with full packs etc. and age. I will be 54 next year and although I feel great and get the mileage in at home every week it does take its toll, but as I sit here writing this I could cycle forever. I feel fine now.